Why do policies and business practices that ignore the moral and generous side of human nature often fail? Should the idea of economic man—the amoral and self-interested Homo economicus—determine how we expect people to respond to monetary rewards, punishments, and other incentives? Samuel Bowles answers with a resounding “no.” Policies that follow from this paradigm, he shows, may “crowd out” ethical and generous motives and thus backfire. But incentives per se are not really the culprit. Bowles shows that crowding out occurs when the message conveyed by fines and rewards is that self-interest is expected, that the employer thinks the workforce is lazy, or that the citizen cannot otherwise be trusted to contribute to the public good. Using historical and recent case studies as well as behavioral experiments, Bowles shows how well-designed incentives can crowd in the civic motives on which good governance depends. Comece a ler The Moral Economy no seu Kindle em menos de um minuto. Samuel Bowles directs the Behavioral Sciences Program at the Santa Fe Institute and is the author of Microeconomics: Behavior, Institutions, and Evolution; A Cooperative Species: Human Reciprocity and Its Evolution (with Herbert Gintis);andThe New Economics of Inequality and Redistribution. Muito bem escrito, construído e argumentado, mostrando que incentivos e seu funcionamento são bem mais complicados que os economistas pensam. É que ainda há muito o que pesquisar sobre o tema. Used to work at Nokia in 90ies when when incentives were introduced. The size of incentives were dependent on the increase of the value in the company during the incentive period and the incentives became huge. I got the impression people who got those huge incentives maybe did not work as enthusiastically any more after they got the money. First I thought it was because they got so much money they did not have any reason to work anymore. But it was much more complicated than that. The incentives did not only erode people's effort level but also their morals: SOME people stopped working out of the only right motives of the engineer ("willing to achieve something cool and useful and something of high quality"). Somehow incentives eroded the "right" motives even in cases when the sums achieved were not huge at all. Samuel Bowles' book discusses the problem why sometimes incentives crowd-out (erode) the social (altruistic, reciprocal etc.) preferences of people when they are acting in the society and the companies. But he also discusses how social and economic incentives in some cases can work in synergy. When economic incentives do not act alone but are combind with a message (e.g. "it is wrong to do A and that's why we will put a monetary penalty for breaking the rule"), the incentives sometimes work together fine. So in the end this an optimistic book. This is not only a book describing the reality as it is but a book which wants to give advice to the Legislator. Bowles sees the task of the Legistlator much in an Aristotelian sense. It is not about creating a society where knaves are through incentives put to work in a manner that contributes to common good. It is also about developing incentives and institutions in a way which creates moral citizens with social preferences - or at least make the rules so, that existing social preferences do not crowd out and that people with social preferences are able to have a positive impact on the society and e.g. through peer punishment affect even how the other people without social preferences act. 24 pessoas acharam isso útil. 3,0 de 5 estrelasIncentives and social norms interact in non-trivial ways. The practice of this insight far exceeds the scope of the book. The Moral Economy is a good, but ultimately impractical, book. It's great in questioning the mechanistic view of incentives that most economists bring to policy-making. It provides a sound mix of theory, evidence, anecdote and philosophy to make its case. Albeit its shortcomings it's well worth the read. Bowles introduces an important perspective into policy-making, with a message targeted at economists: social norms can amplify, cancel or overturn economic incentives designed with an specific outcome in mind. Norms work more or less like a megaphone: they can increase the reach of individual incentives, carrying them louder and farther, or they can screech them into dissonance, distorting or even cancelling-out the intended message. Blending political philosophy with recent findings from experimental economics, Bowles shows how other-regarding preferences, that is, networked utility functions that deliberately account for "the effects of one’s actions on others" (p. 26), introduce a challenge to those Pavlovian economists who believe social problems require little else than a smart mix of carrots and sticks. As Bowles puts it: "The challenge facing the Legislator is that the framing provided by the incentive may affect the salience of the individual’s social preferences, resulting in a level of experienced values different from would have been the case in the absence of the incentive. When this occurs, social preferences and incentives are not separable, and experienced values may be influenced (positively or negatively) by the use of incentives" (pp. 47-48). In short, there is feedback between individual incentives and social norms, and economists have made a mistake assuming this relationship away. 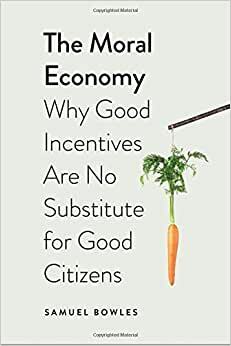 What follows is that incentives are, besides tools to motivate action (pardon the tautology), messages that can further - or hinder - the goal of policies. This communicative role reflects the relationship between policy-makers and their constituents. As Bowles summarizes, "The problem of crowding out may arise when the information that an incentive conveys is off-putting about the person imposing the incentive, or when it frames the problem as one in which self-interested motives are acceptable or even called for, or when the incentive compromises the autonomy of its target" (p. 191). For this reason, incentives such as taxes or fines can have negative unexpected consequences, like the now famous Haifa kindergarten experiment on late pick ups, or positively magnifying effects, like the small tax on plastic bags introduced in Ireland in 2002. Incentives, therefore, can work most of the time if they're accompanied by an adequate appeal to related social norms. The book falls short on explaining what social norms are, how to identify them, and how they should be introduced into policy. The Aristotelian Legislator that Bowles advocates seems too preoccupied with philosophical musings to put together applicable, practical, ways of bringing them into the sphere of policy - a gap that the author might want to help close in the future, as the book offers vague, platitudinous advice to policy makers. Take this "advice" from page 207: "Avoid "bad news". Incentives designed to control or take unfair advantage of the target may not work; ensure fairness in implementation of incentives". This ivory tower style recommendation, and others like it, will never ring in the ears of the policy-makers who actually have to get things done. It seems to me that Bowles' Aristotelian Legislator would be adrift without a close, pragmatic, Aristotelian Engineer. In sum: Good on political philosophy, economic theory and experimental evidence. Lacking in concreteness to be useful in actual policy.